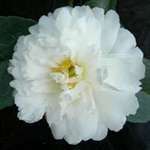 Large, pure white, scented, formal double flower with numerous, rounded petals. The stamens are rarely visible. Vigorous, upright and fast growth with slender branches. Flowers in November/December. Prefers a sunny, sheltered position. This can be one of the more tricky sasanquas to grow, as it can be prone to shed flower buds in wet, winter conditions, but when grown successfully the flowers are quite stunning. Large, pure white, formal double flower with numerous, rounded petals. Stamens rarely visible. Vigorous, upright and fast growth with slender branches. Flowers in autumn/winter, late season. Plant arrived in excellent condition. Will happily recommend the excellent service provided. I've bought over 30 plants now from Trehanes in the last 12 months and never have I been disappointed. The plants are of excellent quality, and the delivery is speedy and the packaging is brilliant. What's more, they are very reasonably priced. Thanks Trehanes! The plant received was of Ecellent Quality, sturdy and bushy. The shape was well-balanced, and the glossy green leaves indicated its good health and vigour. Much look forward to it in flower. If my previous Trehane purchases are anything to go by, I know I shall be equally delighted! !